I have often cycled past this pretty little chapel over the years on my way to the church at Stanningfield or to friends at Lawshall. It just so happened that when I stopped to take a photograph of it recently, a kind couple were just on their way inside to see if the flowers needed changing, and welcomed me inside to take a look. The chapel is set in open fields on the border between the parishes of Stanningfield and Bradfield Combust, with just the former Methodist school for company. Beyond the north end, the fields were stark on this bright spring day. The plaque on the front dates it to 1867. The interior is simple and pleasing, and many of the furnishings are late 19th century, despite the loss of the gallery in recent years. 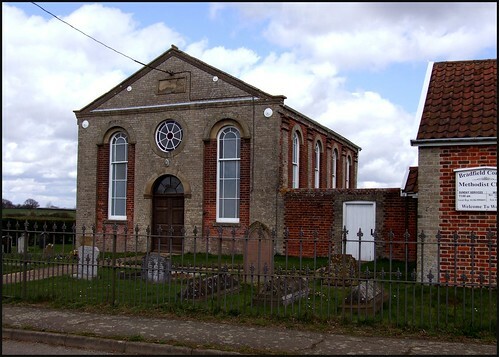 Stanningfield was an unusual village in 19th century Suffolk, because the great majority of the villagers were either Catholics or Methodists. There seems to have been hardly any Anglicans at all. Both the Catholics and the Methodists had their own schools, both closing eventually in the years before the Second World War. The former school here has been recently restored after nearly collapsing, and now forms a useful hall. Out the back are little rooms which were once the home of the schoolmistress - she slept in the attic, under the eaves. These days, most people know Stanningfield because of its most wealthy resident, the actress Claudia Schiffer, who lives at the Hall. She seems not to have gone out of her way to win friends in the area, attempting to get a footpath closed which crossed the Hall grounds. As the man who showed me around explained, the footpath was used by Stanningfield and Bradfield Combust Catholics crossing to the Catholic Church at Coldham Hall, in Lawshall parish. The villages had fought the attempted closure tooth and nail, the Methodists and Anglicans adding their weight to the Catholic fight, and had succeeded in thwarting the closure. I thought how wonderful it was that Ms Schiffer had been the cause of such ecumenical activity, if only she knew.